Recently I started updating my sound and home cinema system. Most of it of course I bought from different shops, but some things I like to do myself. It saves money sometimes and counts as a hobby. What did I do? Well, I didn’t have enough time to design and build my own amplifier or another pair of nice speakers, so I ended up making my own speaker cables. What’s so special about that? You just get some cable, strip the ends, put it in the screw terminals on the speakers and the amplifier and you are done, you say. Not when you try to achieve high performance. Here is what it looks like. It isn’t very difficult to make such nice looking cable and it saves money.So how much did I save? You will find out along the way. 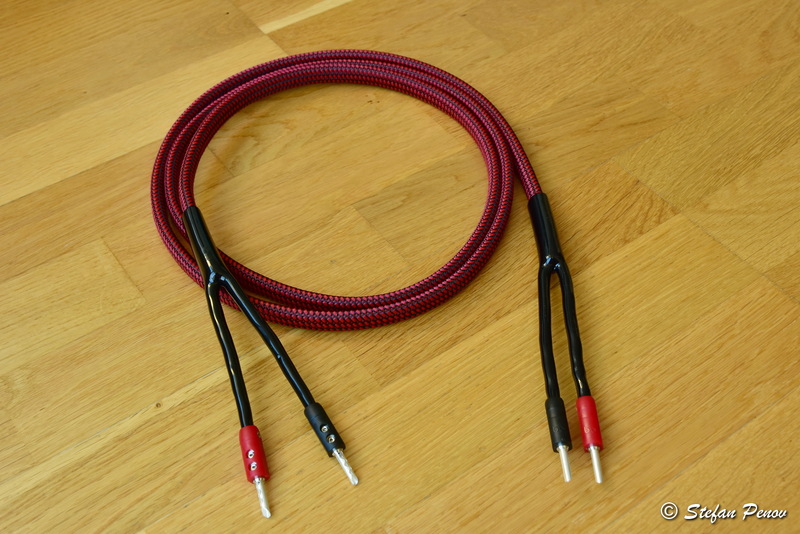 I made a pair of cables, each 2.20m long. 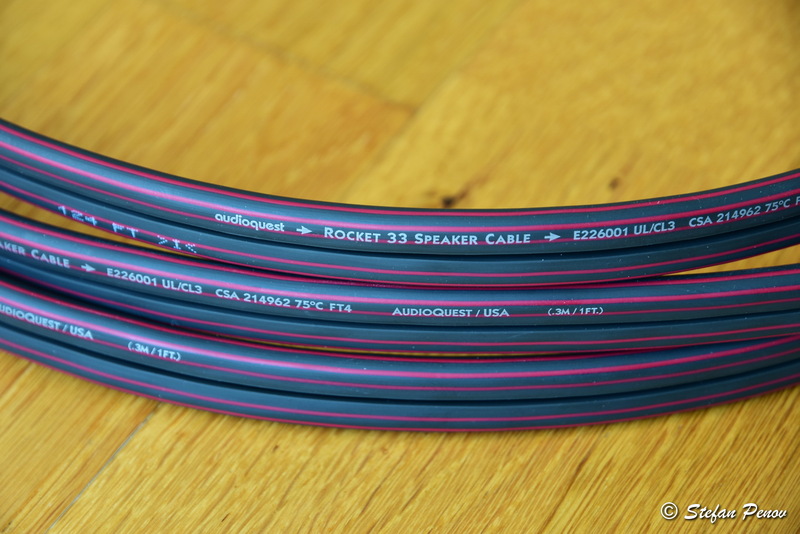 The cost of a 2m pair of the same cable AudioQuest Rocket 33, but factory made was €255. Now you see I wasn’t talking about a low cost cable. Here is how the factory made cable looks like. Not much difference as you can see. I don’t have the marking and the rocket on the cable pants, but that doesn’t really matter. The stickers on the banana connectors I have, but I didn’t see a reason to put on. To make my cable I used the same connectors and actual cable. How did I save anything then? I cut it myself, I put the braiding and cable pants on and put the connectors. That saved me from paying for someone else to do it. Let’s have a closer look at what I did and each component I used. The most important part is the cable itself of course. It is called Rocket 33 again. 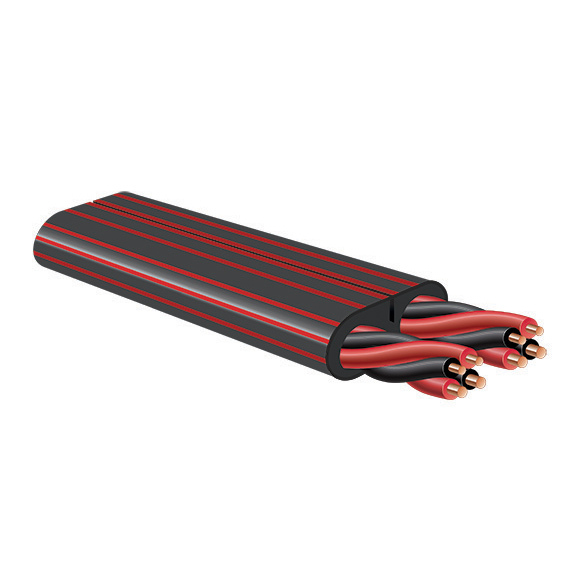 This is high quality cable, designed mainly for bi-wiring purposes. It has two pairs of thinner wires for the high frequency driver and another two pairs of thicker wires for the low frequency driver. 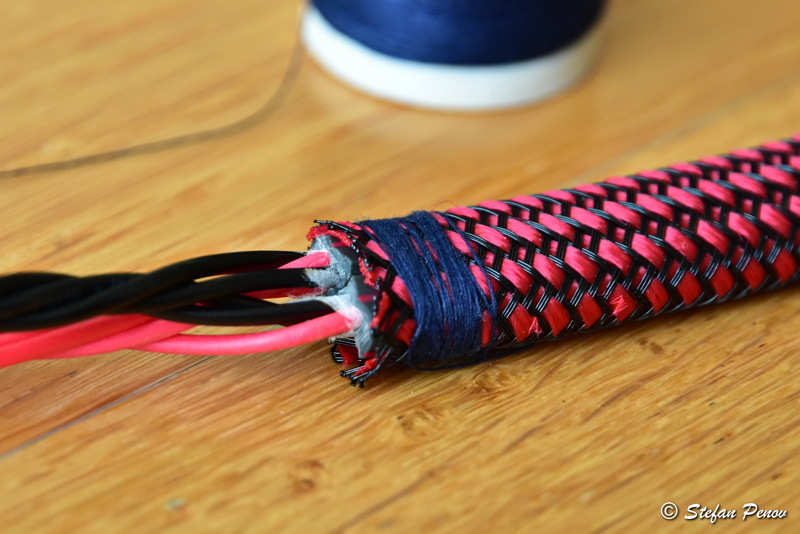 Each sheaf of four wires has one of each colour and thickness. As you might notice from the image, those are single core wires. 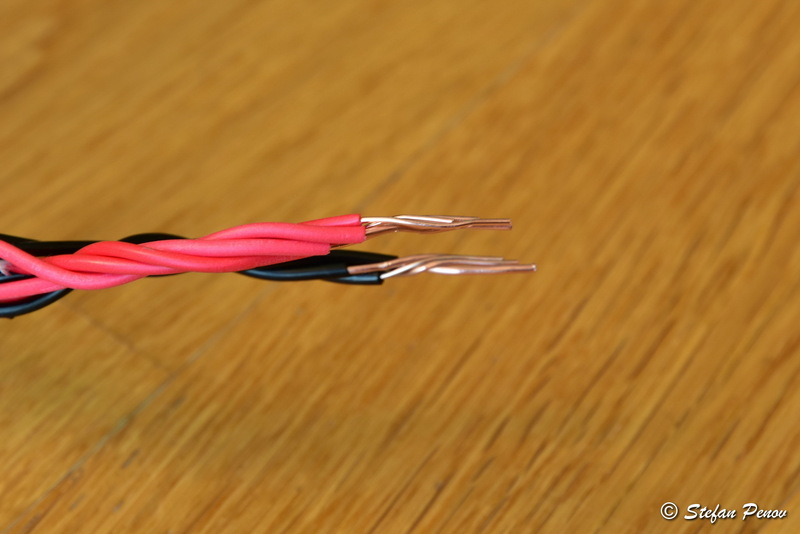 It is the common type of cable for Hi-End systems from what I’ve seen during the years. Now, this is how this cable really looks like. The price per meter for this cable was €25. I bought 4 meters, which makes for €100. When I measured it at home it appeared to be around 4,80m. The guy in the local Hi-End shop did try to add a few centimeters on top of what I asked for, making sure it won’t be shorter. 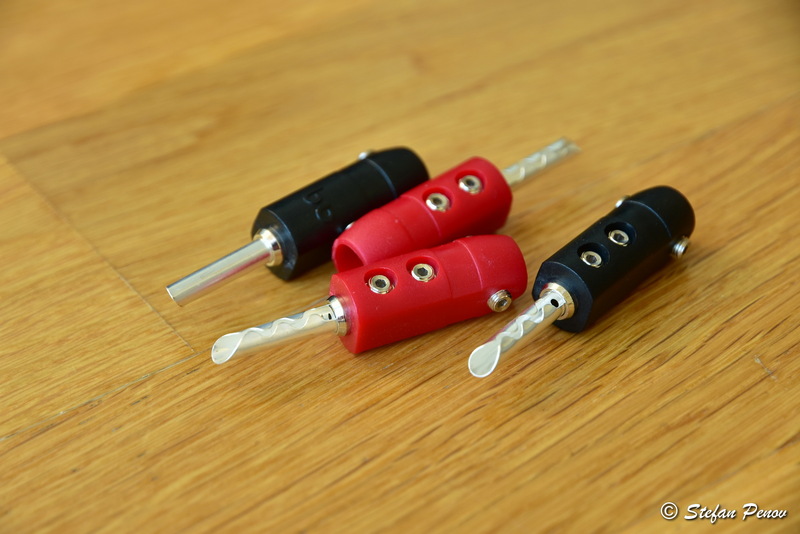 The connectors are AudioQuest SureGrip BFA 300s. Typical banana connectors of a high quality. They have pure silver plating with no nickel or other metal mixed. That is why they don’t have that mirror look. These nice banana plugs cost €9.40 each. Total of 8 cost €75.20. I am converting from NOK so the numbers might be a little rounded, but close enough. So far we are at €175.20 for materials. Next I needed some braiding and cable pants. 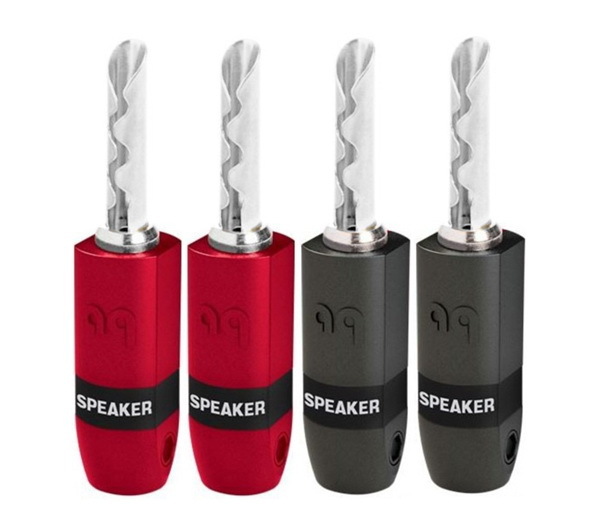 Those were not available at the local Hi-End shop, so I went on eBay. I didn’t go for the cheapest options of course. I looked for good quality, but not the original ones that you see in the factory made cable, because they are just too expensive. For 10m braiding (I used 8m) I paid €12.65. 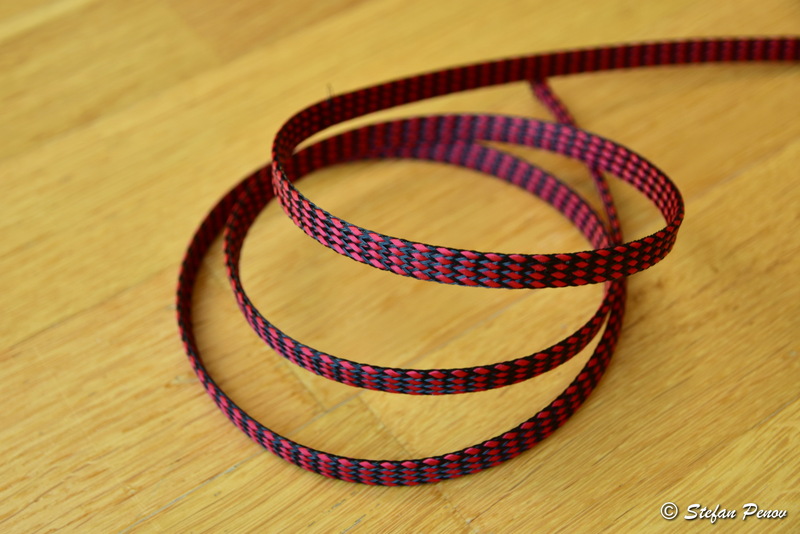 This braiding is made of PET threads (the black ones) and artificial cotton threads (red ones). This makes for a pretty nice look and high density, which covers the cable 100%. The quality was worth the price I think. The cable pants cost me another €9.10 for four of them, half of which was for shipping. This is how they look. They are made of silicone I think. 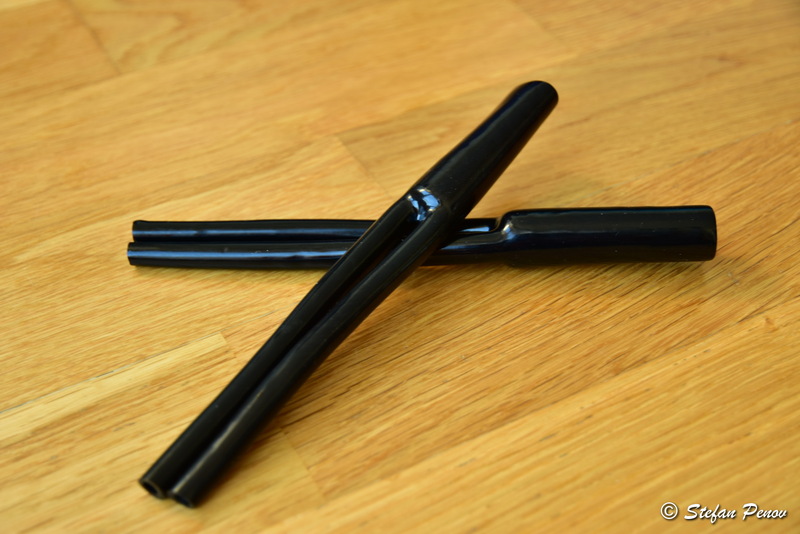 They have a shiny look and are fairly flexible for their thickness. That’s all I bought and the total rounds up to €196.95. This means €30 saved or more than 10% from the original price. 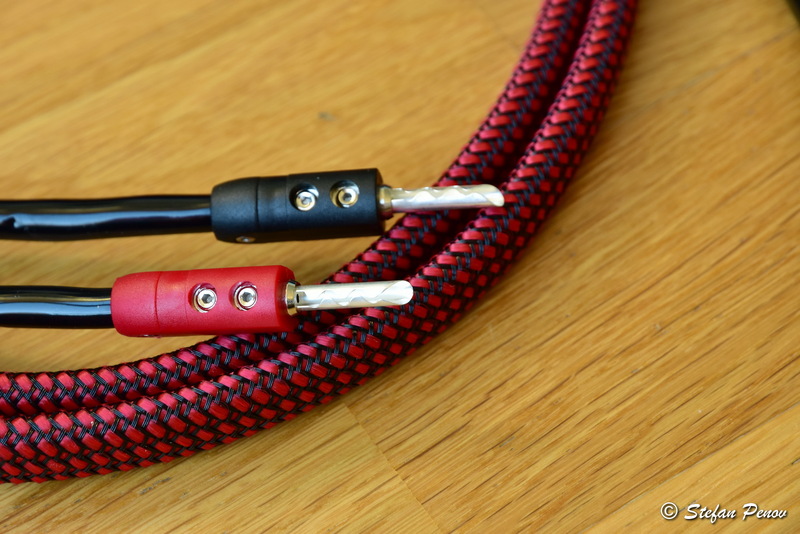 Of course €30 isn’t much when we are talking about Hi-End audio, but it was also fun making those cables. Now let’s see how it’s done. First I cut the cable in two equal pieces for each channel. Then I stripped the outer insulation long enough for the cable pants’ legs. After that I stripped the inner insulation to match the banana connectors’ internal size and twisted the wires with matching colours. That last part was mentioned to me by the guy in the Hi-End shop. It was pretty funny to me that someone might not think of doing that. Next step was to add the braiding. This took some time. I had to add a piece of insulation on the copper wire to make sure it won’t damage the braiding during the process. When I slid the braiding onto the cable, I had to pull it well so it won’t move later. Now comes the important part, making sure the braiding ends won’t split and loosen, which will make the cable look ugly later. How did I do that? Heatshrink? No. Glue? No. I did it the old fashioned way by using sewing thread. I wrapped the end of the outer insulation with enough rounds of thread, made some knots to make it stay there and then cut the braiding. 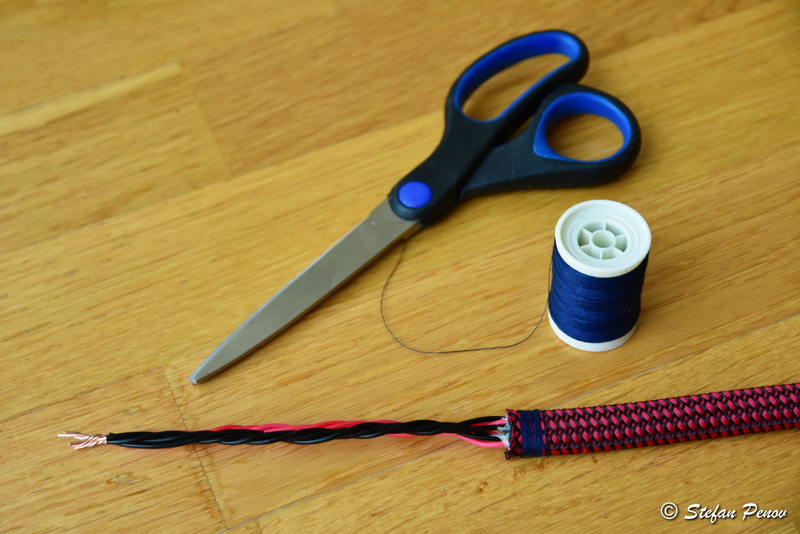 This makes it easier than first cutting the braiding and then putting the thread on. It will hold well for decades unlike heatshrink and isn’t messy like using glue. When that was finished I had to put the cable pants on. Last thing to do was screwing the banana plugs on the cable ends and make sure the pants’ legs fit well in the connectors. You can see a couple of grub screws on the sides of each banana plug. Those are there to add pressure to the pants’ legs and keep them in place. The inside of those screws is flat and polished so it won’t damage the cable. This is how it looks. The whole cable building took me a couple of hours maybe plus going twice to the nearby post office to get the eBay stuff. I am happy with the results. 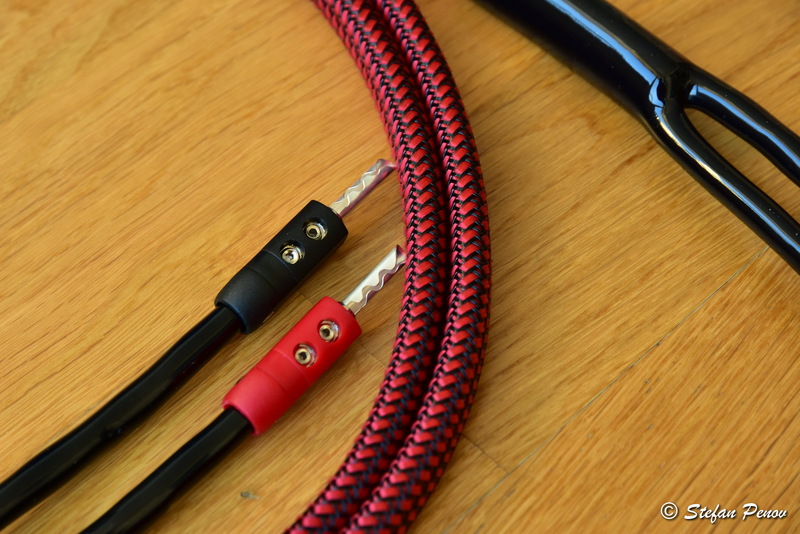 The cables look great and the sound qualities are the same as the original factory made ones. They were actually not available in the shop when I was buying the separate parts. I had to pre-order and wait, so that’s how I ended up building it myself. Posted on 15.10.2016 31.05.2017 by PenoffPosted in Hi-End Speaker CablesTagged audio, cable, Hi-end, HiFi, music, sound, speaker.